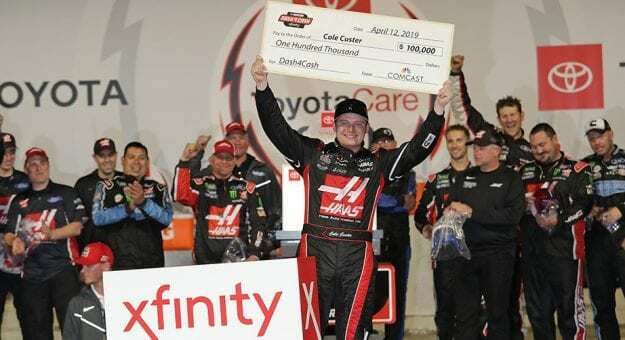 The four-race NASCAR Xfinity Series Dash 4 Cash is back for the 2019 season. The program, which awards $100,000 for each of four races to the top competing driver, is eligible to drivers competing for Xfinity Series driver points. The top four Xfinity Series finishing regulars at Texas Motor Speedway on March 30 are eligible for the Dash 4 Cash prize of $100,000 at Bristol Motor Speedway. The highest finishing driver of those four at Bristol wins the prize and will move on to have a shot at the prize at Richmond Raceway in addition to the top three finishing series regulars. This format continues for the races at Richmond, Talladega Superspeedway and Dover International Speedway (more details below on that). At Texas: The top four finishing Xfinity Series regulars at Texas are eligible for the $100,000 prize at Bristol. No prize is given out at Texas, but it does set the Dash 4 Cash participants for Bristol. Qualifiers for Bristol: Christopher Bell, Tyler Reddick, Chase Briscoe and Michael Annett. At Bristol: The top Dash 4 Cash-eligible finishing driver wins the $100,000 prize at Bristol and will advance to a have a shot at the prize at Richmond along with the three-highest finishing series regulars. Prize winner: Christopher Bell | Qualifiers for Richmond: Christopher Bell, Tyler Reddick, Cole Custer and Chase Briscoe. At Richmond: The top Dash 4 Cash-eligible finishing driver wins the $100,000 prize at Richmond and will advance to a have a shot at the prize at Talladega along with the three-highest finishing series regulars. Prize winner: Cole Custer | Qualifiers for Richmond: Cole Custer, Austin Cindric, Justin Allgaier and Tyler Reddick.